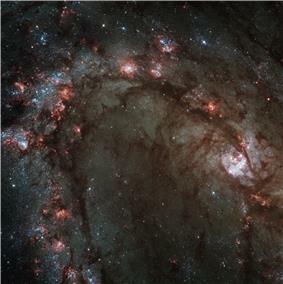 Messier 83 (also known as the Southern Pinwheel Galaxy, M83 or NGC 5236) is a barred spiral galaxy approximately 15 million light-years away in the constellation Hydra. 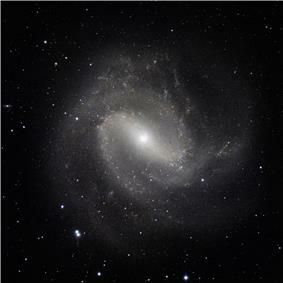 It is one of the closest and brightest barred spiral galaxies in the sky, making it visible with binoculars. 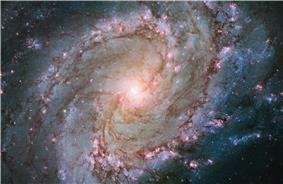 Six supernovae (SN 1923A, SN 1945B, SN 1950B, SN 1957D, SN 1968L and SN 1983N) have been observed in M83. Nicolas Louis de Lacaille discovered M83 on February 23, 1752 at the Cape of Good Hope. Charles Messier added it to his catalogue of nebulous objects (now known as the Messier Catalogue) in March 1781. On 16 June 2008 NASA's Galaxy Evolution Explorer project reported finding large numbers of new stars in the outer reaches of the galaxy. It had hitherto been thought that these areas lacked the materials necessary for star formation. M83 is at the center of one of two subgroups within the Centaurus A/M83 Group, a nearby galaxy group. Centaurus A is at the center of the other subgroup. These two groups are sometimes identified as one group and sometimes identified as two groups. However, the galaxies around Centaurus A and the galaxies around M83 are physically close to each other, and both subgroups appear not to be moving relative to each other. 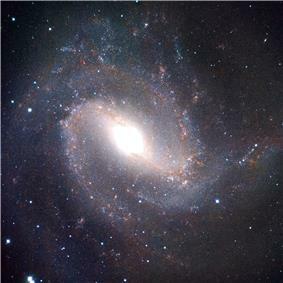 An ESO image of Messier 83. ^ "A galaxy with two hearts". ESA/Hubble Picture of the Week. Retrieved 18 January 2014. ^ a b c d e f g h "NASA/IPAC Extragalactic Database". Results for NGC 5236. Retrieved 2006-12-08. ^ Saha, A.; Thim, F.; Tammann, G. A.; Reindl, B.; Sandage, A. (2006). "Cepheid Distances to SNe Ia Host Galaxies Based on a Revised Photometric Zero Point of theHSTWFPC2 and New PL Relations and Metallicity Corrections". The Astrophysical Journal Supplement Series 165: 108. ^ "SIMBAD-M83". SIMBAD Astronomical Database. Retrieved 2009-11-29. ^ "SIMBAD astronomical database". Results for M83. Retrieved 2007-05-02. 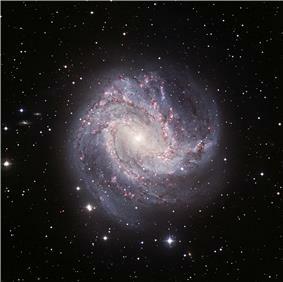 ^ "Multimedia Gallery: M83 – Southern Pinwheel Galaxy". NASA/JPL-Caltech/WISE Team. 25 June 2010. ^ a b K. G. Jones (1991). Messier's Nebulae and Star Clusters (2nd ed.). Cambridge: Cambridge University Press. ^ "Stellar Birth in the Galactic Wilderness". ^ I. D. Karachentsev; M. E. Sharina; A. E. Dolphin; E. K. Grebel; D. Geisler; P. Guhathakurta; et al. (2002). "New distances to galaxies in the Centaurus A group". Astronomy and Astrophysics 385 (1): 21–31. ^ R. B. Tully (1988). Nearby Galaxies Catalog. Cambridge: Cambridge University Press. ^ Fouque, P.; Gourgoulhon, E.; Chamaraux, P.; Paturel, G. (1992). "Groups of galaxies within 80 Mpc. II – The catalogue of groups and group members". Astronomy and Astrophysics Supplement 93: 211–233. ^ A. Garcia (1993). "General study of group membership. II – Determination of nearby groups". Astronomy and Astrophysics Supplement 100: 47–90. ^ I. D. Karachentsev (2005). "The Local Group and Other Neighboring Galaxy Groups". Astronomical Journal 129 (1): 178–188. Bauer, Amanda; Haese, Paul. "M83 – Southern Pinwheel Galaxy". Deep Space Videos.